Well, I did something today that I have wanted to do for a long time: I bought a Galco Miami Classic for the S&W 6906. I have become more and more oppressed with the feeling of weight on my belt with the 1911 and a spare magazine (plus knife, keys, change and billfold). The draw isn’t as fast as a belt holster but it is comfortable, especially for activities like driving or walking the dogs. The matter of comfort is really a study in trade-offs – weight around your waist pulling your pants down or weight on your shoulders with gun and mag carrier slung under your arms. I find that when I walk a lot, a belt holster, especially an IWB, rubs and causes my shirt to work up. With many belt holsters, riding a long time with a seat belt on can get quite uncomfortable, and of course, it is impossible to get to the gun quickly when you’re sitting on it and the seat belt is strung across it. Pilots have long favored shoulder holsters for these reasons. The sensation of wearing a shoulder holster is definitely that of being geared-up, not unlike wearing a load-bearing tactical vest. You are conscious of it. You feel the gun and mag carrier under your arms, but it is not as bulky and uncomfortable as you might expect. I really anticipated that having the gun and mag carrier under my arms would feel awkward, but when you get it adjusted properly, the holster and carrier get out of the way and it doesn’t feel like carrying a lunchbox under each arm. How much slower is the draw? My best recorded time to draw and put two shots COM from a belt holster is 1.43 seconds. With the shoulder holster, I’m sure that time would go to at least 2 and perhaps 2.5 seconds. The grab is a little less certain; you have to break the thumb break and swing the gun out laterally, turning it a full 180 compared with the straight up and push out draw stroke from a belt holster. One old warrior observed that if you’re forced into a fast draw, you’re not paying attention. Basically, I believe this to be true and those who have studied gunfights say that personal defense situations are almost never decided by a quick draw. Still, a quick draw is better than a slow one, and this issue is the biggest negative to me for the shoulder holster. I read a bit by a South African security guy who said they liked the shoulder holster because it was quick to get on when they were called out. Gun, magazines and leather were all there in one parcel which could be grabbed and put on as they were running out of the station. In daily carry I notice this to be true. 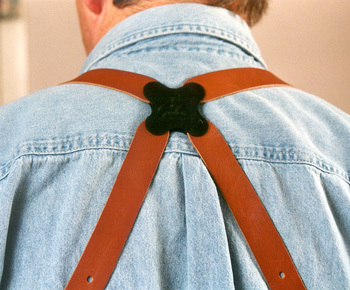 It is easier and quicker to slip your arms through the straps of the shoulder holster than to thread a mag pouch and holster onto a leather belt. And you can pretend you’re Sonny Crockett. You have to endure jokes from your teenage offspring about Sonny Crockett. 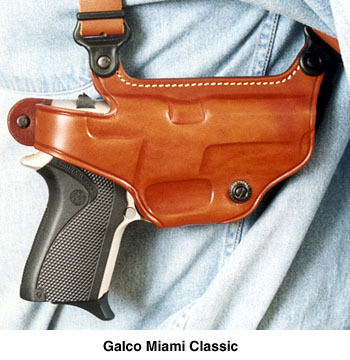 This original shoulder system was first introduced by Galco in 1969 (then the Jackass Leather Co.). It was worn by Don Johnson (a.k.a. Sonny Crockett) on the television series Miami Vice, and that’s probably when I started craving one. Crockett’s rig always just looked so cool. The Miami Classic is a beautifully rendered piece of equipment. The leather is molded well and given a deep and durable finish. Galco’s attention to detail is noteworthy. The thumb break has a metal reinforcement for positive unsnapping during the draw. The straps can be easily adjusted for fit. The mag carrier cover flaps have two snaps each which will allow you to carry either standard size or longer magazines. The tie-down attachment on the mag carrier will fold up and out of the way if you chose not to use a tied down. The holster and magazine carrier both have tensioning screws and fit like a glove. A key component of this shoulder system is its unique spider harness. All four points of the spider harness can pivot independently and are connected by a clover-shaped swivel back plate. 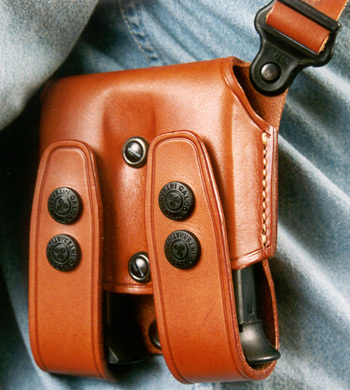 This allows the holster to adjust itself to your shape and movements. This system is constructed of premium saddle leather and includes holster, harness, and ammo carrier. Optional accessories such as ammo-side tie-downs and other holsters may be purchased separately. The Miami Classic is available for right-handed and left-handed shooters, in tan or black finish.